When decay occurs below the gum line, it may be necessary to remove a small amount of bone and gum tissue. Your dentist may request this procedure before he or she makes a new crown for your tooth. 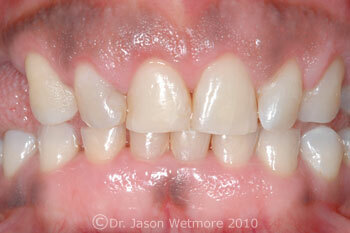 Crown Lengthening procedures are done for both restorative dentistry and/or to improve the esthetics of your gum line. Prior to the restoration of broken or severely decayed teeth, this procedure adjusts the gum and bone level to expose more of the tooth so it can be restored. 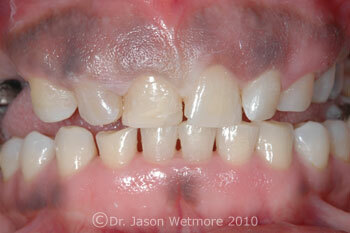 Sometimes crown lengthening is done to improve a "gummy" smile because the teeth appear short. The teeth may actually be the proper length but excess gum tissue may be covering these teeth. During this procedure, excess gum and bone tissue is reshaped to expose more of the natural tooth. If you feel you have a gummy smile, the doctors at Ocean Breeze Dental will be more than happy to discuss the options available to you. The below patient achieved a dramatic change in her smile with one simple procedure, and no crowns, veneers, or expensive restorations were required.